Feeling overwhelmed by the size of the Volume binders? Not sure where to start reading? You'll be glad to know that Weaver has a product just for you! Weaver Teacher's Friend includes information that will get you started with the curriculum. From setting up the Teacher's Binder to reading Teaching Tips & Techniques to deciphering the Day by Day lesson plan book—Teacher's Friend explains everything in an easy to understand way. Weaver Teacher's Friend walks you through, step-by-step, showing you how to insert pages from the Volume, the Day by Day, the 7-12 Supplement, and Wisdom Words in one binder to make teaching with Weaver easier. No more lugging around three or four huge binders! Your Teacher's Binder will hold all the information you need from whatever unit, and whatever Volume, you're working in. Teacher's Friend is like having your own personal mentor helping you become familiar with all the components of the Weaver curriculum. It will give you tips on setting up your own binder to make teaching easier. It will encourage you to take baby steps—one unit at a time—as you work your way through The Weaver Curriculum®. 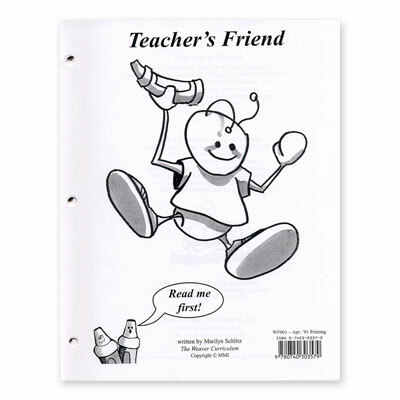 Order your copy of Weaver Teacher's Friend from Alpha Omega Publications today, and start homeschooling the Weaver way!